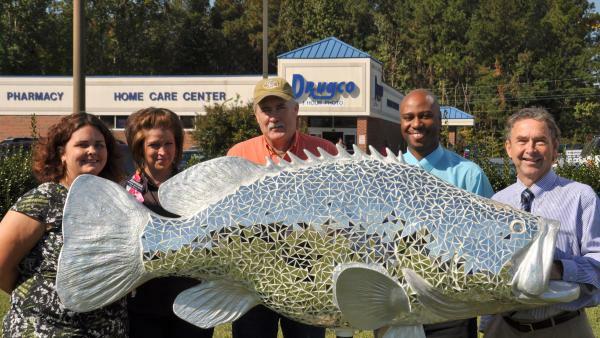 Their fish, covered almost entirely with triangular mirrored tiles, reflects the importance of their customers and was designed and crafted by artist Traci Watson of Mary Sherwood Lake Living. DrugCo offers a discounted alternative to national pharmacy chains with all the usual pharmacy staples, including a one-hour photo and home care center. DrugCo makes filling or refilling a prescription easy with a two-lane drive-thru, home delivery to local customers and monthly automatic refills of prescriptions. The retail section sells pain relievers, home medical supplies, children’s products and much more. The pharmacists at DrugCo can administer shingles, flu and pneumonia vaccines, perform blood sugar and cholesterol screenings and check blood pressure. In addition to Roanoke Rapids, there are also locations in Ahoskie and Littleton. Monday - Friday 8 a.m. – 8 p.m., Saturday from 8 a.m. – 7:30 p.m. and Sunday from 12:30 p.m. – 6 p.m.